Gas-phase cyclic volatile methyl siloxanes and their oxidation products, which are likely precursors to secondary organic aerosol, were modeled using an atmospheric transport model over North America. Typical concentrations, spatial patterns, seasonal variability, and vertical profiles were quantified. Urban parent compound concentrations were sensitive to transport factors, while rural parent and oxidized product concentrations were sensitive to large-scale seasonal variability in OH. The effects of wet or dry salt seed particle concentration (ammonium nitrate and ammonium sulphate) on secondary organic aerosol mass yields from a mixture of m-xylene and α-pinene were examined in an oxidation flow reactor. The experiments confirmed that increasing the condensation sink significantly increases the particle mass yields in oxidation flow reactors. 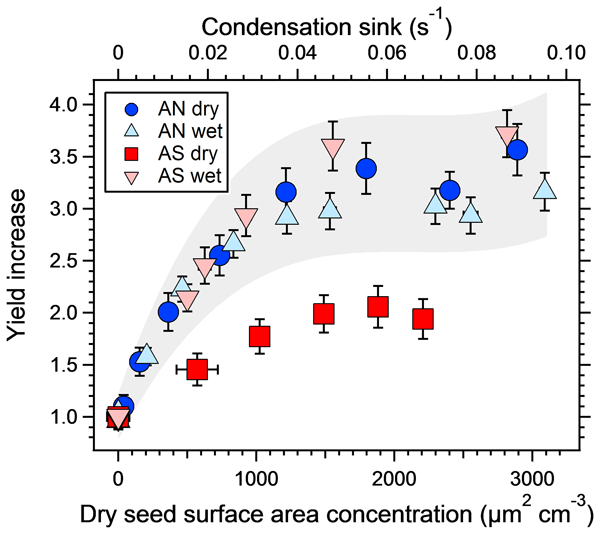 Further, wet seed particles increased the particle mass yield by 60 % more than dry particles. A potential aerosol mass (PAM) reactor expedites slow atmospheric oxidation reactions and enables the observation of chemical aging processes and the determination of the aerosol-forming power of an air mass. A PAM reactor was deployed at Baengnyeong Island in the Yellow Sea. 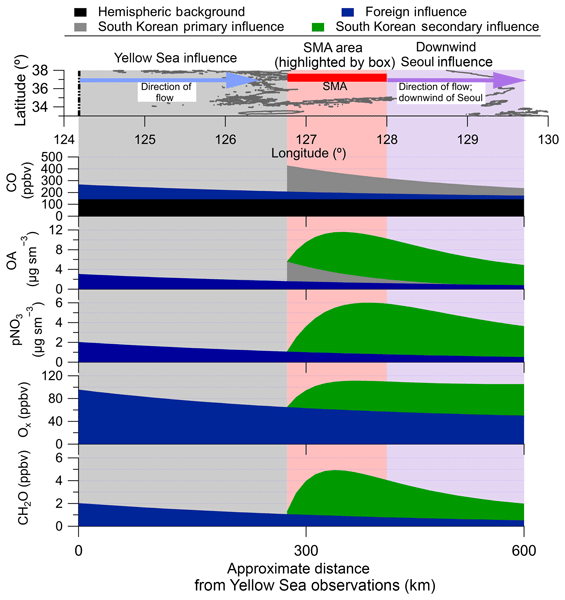 Experimental results confirm the key role of SO2 in generating secondary aerosols in northeast Asia, and the contribution of organics to secondary aerosols is more variable during transport in the atmosphere. Observations of increased ozone on hotter days are widely reported, but the mechanisms driving this relationship remain uncertain. We use measurements from the rural southeastern United States to study how temperature affects ozone production. We find that changing NOx emissions, most likely from soil microbes, can be a major driver of increased ozone with temperature in the continental background. These findings suggest that ozone will increase with temperature under a wide range of conditions. We applied a global sensitivity analysis to the GEOS-Chem chemical transport model analyzing some well-studied tropospheric oxidants for a time period corresponding to an aircraft field campaign. We find modeled results generally agree with measurements when uncertainties in both the model and measurements are taken into account. While model results were largely sensitive to emissions, chemical reaction rates also represented a large source of uncertainty. In these laboratory studies, two types of biomass burning organic aerosol (BBOA) were generated in a combustion chamber and treated in a flow reactor to mimic atmospheric oxidation. Complementary bulk and molecular chemical measurements show that while many species deplete with oxidation, oxidized BBOA markers are enhanced. The results provide insight into the complex chemical evolution of BBOA over nearly 10 days of atmospheric photochemistry, informing future laboratory and field studies. Ozone production rates were measured using the Measurement of Ozone Production Sensor (MOPS). Measurements are compared to modeled ozone production rates using two different chemical mechanisms. At high nitric oxide levels, observed rates are higher than those modeled, prompting the need to revisit current model photochemistry. These direct measurements can add to our understanding of the ozone chemistry within air quality models and can be used to guide government regulatory strategies. The effect of fuel ethanol content (10–100 %) on primary emissions and the subsequent secondary aerosol formation was investigated for a Euro 5 flex-fuel gasoline vehicle. The emissions were characterized during the New European Driving Cycle (NEDC) using high time-resolution instruments. The chemical composition of the exhaust particulate matter was studied using a soot particle aerosol mass spectrometer (SP-AMS), and the secondary aerosol formation was studied with an oxidation chamber. To better understand the sources of uncertainty in modeled Arctic tropospheric oxidants, we created and analyzed an ensemble of chemical transport model runs with inputs perturbed according to their respective uncertainties. Ozone and OH were most sensitive to various emissions and chemical factors. 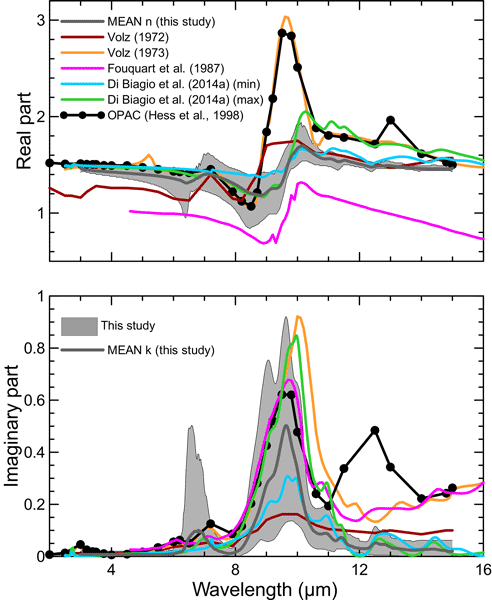 HO2 was overwhelmingly sensitive to aerosol particle uptake. When compared to airborne measurements, better agreement was found when the model used lower aerosol particle uptake rates. IEPOX-SOA is biogenically derived secondary organic aerosol under anthropogenic influence, which has been shown to comprise a substantial fraction of OA globally. We investigated the lifetime of ambient IEPOX-SOA in the SE US and Amazonia, with an oxidation flow reactor and thermodenuder coupled with MS-based instrumentation. The low volatility and long lifetime of IEPOX-SOA against OH radicals' oxidation (> 2 weeks) was observed, which can help to constrain OA impact on air quality and climate. OH reactivity can be used to assess the amount of reactive carbon in an air mass. “Missing” reactivity is commonly found in forested environments and is attributed to either direct emissions of unmeasured volatile organic compounds or to unmeasured/underpredicted oxidation products. Using a box model and measurements from the 2013 SOAS campaign, we find only small discrepancies in measured and calculated reactivity. Our results suggest the discrepancies stem from unmeasured direct emissions. The lifetime of nitrogen oxides (NOx) is evaluated by analysis of field measurements from the southeastern United States. At warm temperatures in the daytime boundary layer, NOx interconverts rapidly with both PAN and alkyl and multifunctional nitrates (RONO2), and the relevant lifetime is the combined lifetime of these three classes. We find that the production of RONO2, followed by hydrolysis to produce nitric acid, is the dominant pathway for NOx removal in an isoprene dominated forest. An oxidation flow reactor (OFR) was deployed to study secondary organic aerosol (SOA) formation and aging of urban emissions at a wide range of OH exposures during the CalNex campaign in Pasadena, CA, in 2010. Results include linking SOA formation to short-lived reactive compounds, similar elemental composition of reactor-aged emissions to atmospheric aging, changes in OA mass due to condensation of oxidized gas-phase species and heterogeneous oxidation of particle-phase species. Oxidation flow reactors (OFRs) are promising tools of studying atmospheric oxidation processes. Elevated concentrations of both OH and non-OH oxidants in OFRs leave room for speculation that non-OH chemistry can play a major role. Through systematic modeling, we find conditions where non-OH VOC fate is significant and show that, in most field studies of SOA using OFRs, non-OH VOC fate in OFRs was insignificant. We also provide guidelines helping OFR users avoid significant non-OH VOC oxidation. We provide experimental evidence that terpene and isoprene SOA form substantial amounts of OH radicals upon interaction with liquid water and iron. Our measurements and model results imply that the chemical reactivity of SOA in the atmosphere, particularly in clouds, can be faster than previously thought. Inhalation and deposition of SOA particles in the human respiratory tract may lead to a substantial release of OH radicals in vivo, causing oxidative stress and adverse aerosol health effects. This work details the evaluation of PM2.5 carbon, VOC precursors, and OH estimated by the CMAQ photochemical transport model using routine and special measurements from the 2010 CalNex field study. Here, CMAQ and most recent emissions inventory (2011 NEI) are used to generate model PM2.5 OC estimates that are examined in novel ways including primary vs. secondary formation, fossil vs. contemporary carbon, OH and HO2 evaluation, and the relationship between key VOC precursors and SOC tracers. We compared the chemistry and yields of SOA generated from OH oxidation of gas-phase precursors in a flow reactor (high OH, short residence time) and environmental chambers (low OH, long residence time). We find that chemical composition of SOA produced in the flow reactor and in chambers is similar. SOA yields measured in the flow reactor are lower than in chambers. Seed particles increase the yield of SOA produced in the flow reactor and may account in part for higher SOA yields in chambers. 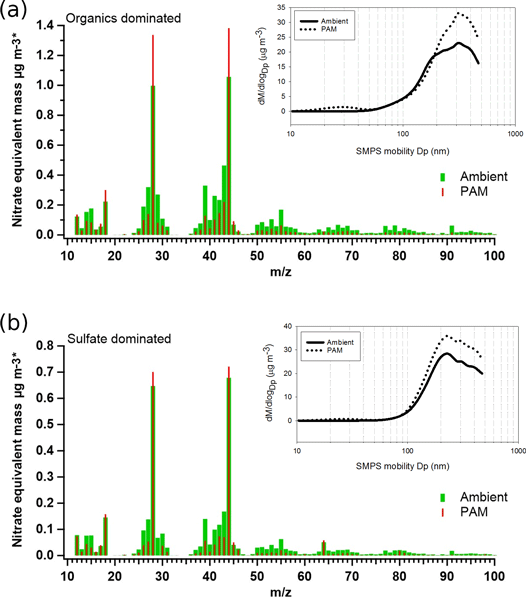 Amiens play important roles in atmospheric secondary aerosol formation and human health, but the fast response measurements of amines are lacking. Here we show measurements in a southeastern US forest and a moderately polluted midwestern site. Our results show that gas to particle conversion is an important process that controls ambient amine concentrations and that biomass burning is an important source of amines. Organic compounds may form a barrier to condensation. Such barriers have been hypothesized to prevent water and other substances from mixing with salt cores. This will hinder the particles' ability to aid cloud formation of < 100 nm particles. Here we perform experiments encasing particles in plastic shells akin to water bottles. 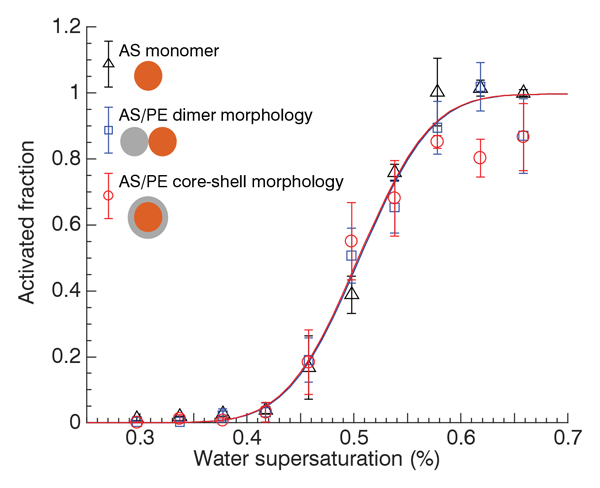 Against expectations, the plastic shell did not alter the droplet activation behavior of the encased particles. Water appears to readily permeate the plastic shell. The formation of cloud droplets involves the condensation of water onto preexisting particles in the atmosphere. The efficiency of this process depends on the nature of the particles, and recent work has shown that organic-rich particles may exhibit a suppressed surface tension that promotes the formation of cloud droplets. 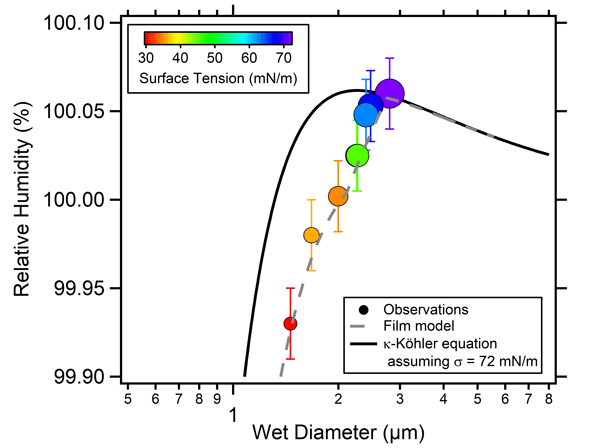 In this technical note, we discuss the mechanism for this and highlight the evolution of surface tension as the key factor in the extent of surface effects. 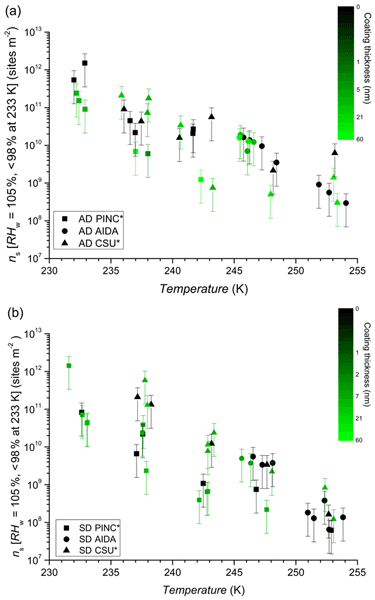 This experimental study investigates the influence of volcanic ash chemical composition, crystallinity, and mineralogy on its ability to promote freezing of supercooled water. The results indicate that crystals in ash play a key role in this process, and suggest that alkali and plagioclase feldspars in ash may be highly ice-active. These findings contribute to improving understanding of the potential of ash emissions from different explosive eruptions to impact ice formation in the atmosphere. It is clear that considerable uncertainties still exist in understanding the magnitude of aerosol absorption on a global scale and its contribution to global warming. This manuscript provides a comprehensive assessment of the optical absorption by organic aerosols (brown carbon) from residential wood combustion as a function of atmospheric aging. 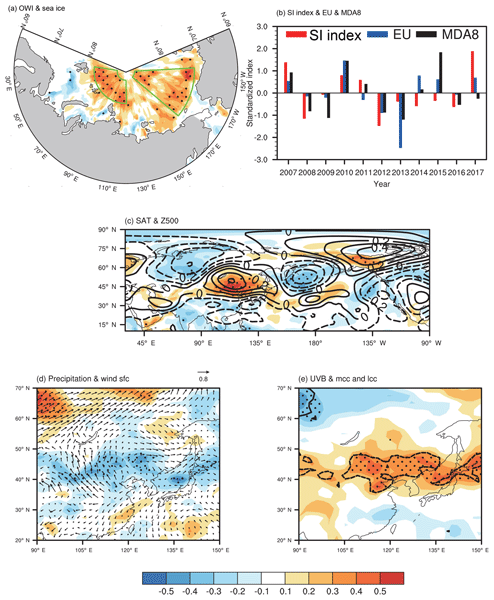 Two surface layer schemes are evaluated in eastern China based on observational flux data. The results indicate that the Li scheme better describes regional atmosphere stratification compared with the MM5 scheme, especially for the transition stage from unstable to stable atmosphere conditions, corresponding to PM2.5 accumulation. Our research suggests the potential improved possibilities for severe haze prediction in eastern China by coupling Li online into atmosphere chemical models. Atmospheric black carbon (BC) particles are a concern due to their impact on air quality and climate. Their net climate effect is, however, still uncertain. In this study, laboratory measurements were performed to investigate cloud condensation nuclei (CCN) activity of BC particles, in pure state or coated by various organic species. Our results show that existing theories have potential in describing the CCN activation of atmospheric BC mixed with soluble pollutants. We characterized optical properties of flame-derived black carbon particles and interpret our observations through the use of Mie theory and Rayleigh–Debye–Gans theory. 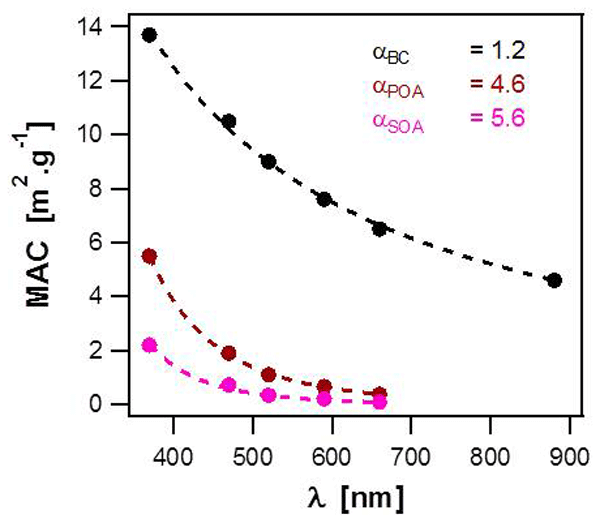 We determined that the mass absorption coefficient is independent of particle collapse and use this to derive theory- and wavelength-specific refractive indices for black carbon (BC). We demonstrate the inadequacy of Mie theory and suggest an alternative approach for atmospheric models to better represent light absorption by BC. Our work establishes how surface tension reduction influences droplet growth and activation of simple sea spray mimics (NaCl coated with fatty acids). Fatty acids can substantially reduce droplet surface tension near activation but have limited impact on activation. Coating of NaCl by palmitic acid (a wax) impedes water uptake, but this impedance is removed if oleic acid (a liquid) is mixed in. The properties that surface-active compounds need to impact activation are theoretically examined. The findings in this study show that morphological transformation of soot occurs via two key complementary and sequential processes, i.e., void filling in the particle and its diameter growth. 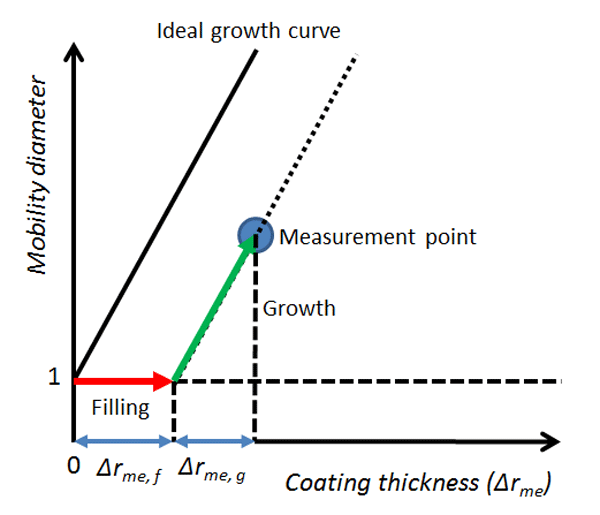 To quantify the state of morphological transformation, i.e., the utilization of material for filling and growth during the condensation processes, a framework was developed which can further be utilized to quantify the effect of condensed material on the optical and hygroscopic properties of soot. A supernova within a distance of about 100 pc from the Earth would increase the cosmic ray flux and thereby the atmospheric ionization. We study the impact of high ion concentrations on aerosol nucleation through experiments. The measurements show that nucleation increases by up to an order of magnitude when the ionization increases from background to supernova levels under fixed concentrations of the nucleating gas. This suggests that a supernova could influence the atmospheric microphysics. The refractive index of atmospheric extracts sourced from urban (London), remote (Antarctica), and woodsmoke aerosol was determined by applying optical trapping simultaneously with Mie spectroscopy. In addition, owing to the absorbing nature of woodsmoke and an aqueous humic acid aerosol extract, the absorption Ångström exponent could be determined.The refractive index and absorption Ångström exponent were then applied in a top-of-the-atmosphere albedo radiation transfer model. The nitrate/organic acid mixed aerosols exhibit varying phase behavior and hygroscopic growth depending upon the type of components in the particles. 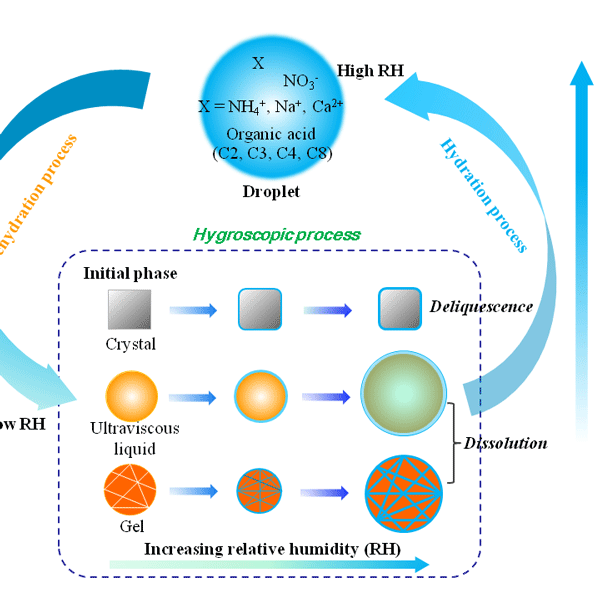 Our results reveal that the coexisting organic acid has considerable impacts on the phase and morphology of nitrate particles in the low and medium RH range, which thus result in obvious enhancement or suppression of water uptake with increasing RH. This new information provided here has important implications for atmospheric chemistry. In this study, we use a new laser imaging nephelometer to measure the bulk aerosol scattering phase function for biomass burning aerosol from controlled fires. By comparing measurements to models for spherical and fractal particles, we demonstrate that the dominant morphology varies by fuel type. This instrument has unique capabilities to directly measure how morphology affects optical properties, and can be used in the future for important validations of remote sensing retrievals. Quantification of new particle formation as a source of atmospheric aerosol is clearly of importance for climate and health aspects. 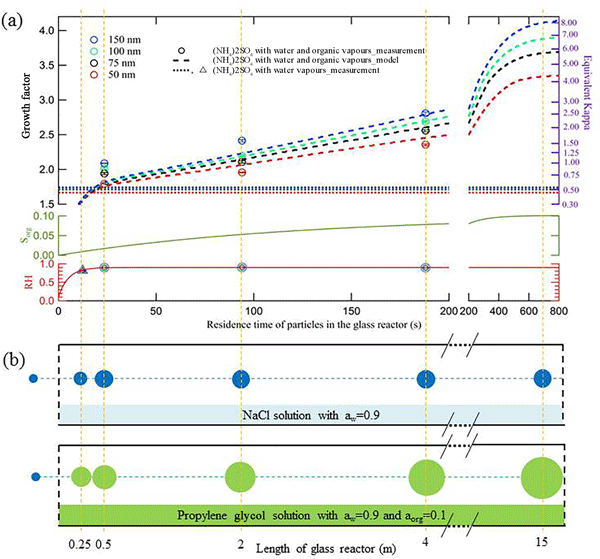 In our new study we developed two analysis methods that allow retrieval of nanoparticle growth dynamics at much higher precision than it was possible so far. Our results clearly demonstrate that growth rates show much more variation than is currently known and suggest that the Kelvin effect governs growth in the sub-10 nm size range. We present results of ground-based measurements and subsequent laboratory analysis of Sahara dust samples collected in Algeria and Mauritania during the Fennec campaign in 2011. The results show that the sampled dust has low absorption characteristics and exhibits a distinct spectral bow-like shape. We find distinctive differences in the composition and optical characteristics of the dust from the two sites, corroborating with other studies that not all Saharan dust is the same. 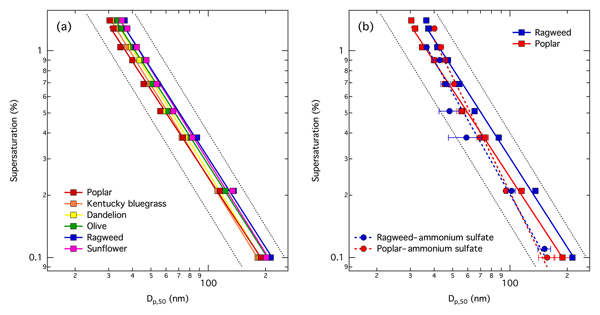 Measurements and thermodynamic equilibrium predictions for organic–inorganic aerosols related to components from biomass burning emissions demonstrate a diversity of hygroscopic growth and shrinking behavior, which we observed using a hygroscopicity tandem differential mobility analyzer (HTDMA). Controlled laboratory experiments with single solutes and/or with mixed organic–inorganic systems of known phase state will be useful to constrain model parameters of thermodynamic equilibrium models. Aerosol–cloud interactions have been recognized as playing an important role in precipitation. As a benchmark evaluation of model results that exclude aerosol effects, the operational precipitation forecast (before any aerosol effects included) is evaluated using multiple datasets with the goal of determining if there is any link between the model bias and aerosol loading. The forecast model overestimates light and underestimates heavy rain. Aerosols suppress light rain and enhance heavy rain. Characteristics of refractory black carbon (rBC) from open biomass burning (OBB) have a great impact on regional pollution and climate, in particular in East Asia. However, experimental study on characteristics of rBC from agricultural residue burning in East China was limited. This study performed laboratory experiments: we found that emission of rBC is highly related to flaming burning, and non-rBC to smoldering burning. Rapid condensation of semi-volatile organics resulted in coated rBC. We report size-dependent water uptake by fresh Indonesian peat burning particles and discuss relationship between water uptake and chemical characteristics. Fresh peat burning particles are almost non-hygroscopic, as determined by both the water-soluble organic fraction and the difference in κ of slightly and highly water-soluble fractions. 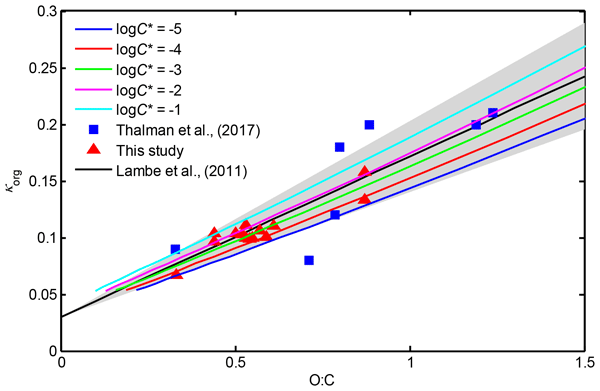 This work experimentally validates the reference for κ of OA-dominated particles, thus contributing to more accurate estimation of aerosol climate impacts. The optical properties of aerosols are required to analyse measurements of aerosol properties, estimate radiative forcing and interpret remote sensing retrievals. We provide comprehensive data sets of the refractive indices of the most important inorganic aerosol constituents, reporting parameterisations for the wavelength and relative humidity dependencies for each system. We assess the accuracy of this study, made on single trapped particles, against previous less comprehensive data sets. The viscosities of four polyols and three saccharides mixed with water were determined. The results from the polyol studies suggest viscosity increases by 1–2 orders of magnitude with the addition of an OH functional group to a carbon backbone. The results from the saccharide studies suggest that the viscosity of highly oxidized compounds is strongly dependent on molar mass and oligomerization of highly oxidized compounds in atmospheric SOM could lead to large increases in viscosity. 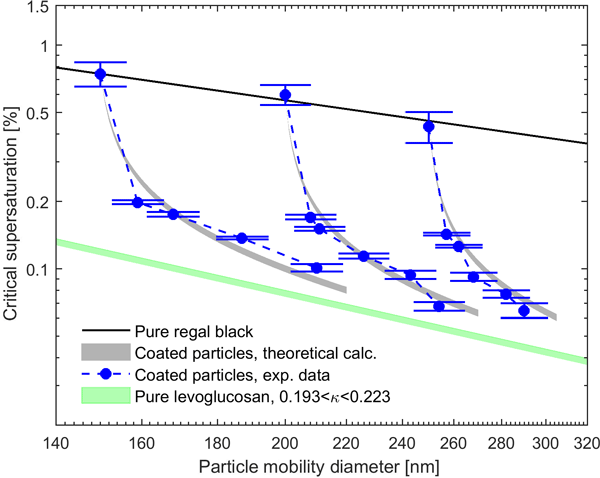 We present quantitative condensed-phase diffusivity measurements of a volatile organic (tetraethylene glycol) in highly viscous single aerosol particles (aqueous sucrose). The condensed-phase diffusivity exhibits a strong temperature and humidity dependence. Our results suggest that diffusion limitations of volatile organics in highly viscous organic aerosol may severely impact gas–particle partitioning under cold and dry conditions. The effective density, chemical composition, and optical properties of particles produced by burning rice straw were measured. Density distribution and single-particle mass spectrometry showed the size-dependent external mixing of black carbon, organic carbon, and potassium salts in biomass burning particles. Optical measurements indicated the significant presence of brown carbon in all particles. Though freshly emitted, light absorption enhancement was observed for particles larger than 200 nm. This study investigates enhancement of black carbon (BC) absorption in biomass burning emissions due to absorbing and non-absorbing coatings. The fraction of absorption due to BC, brown carbon (BrC), and lensing is estimated using different approaches. The similarities and differences between the results from these approaches are discussed. Absorption by BrC is shown to have good correlation with the elemental to organic carbon ratio (EC / OC) and AAE. The response of airborne particles to relative humidity (RH) in the atmosphere, referred to as their hygroscopicity, is a key property that determines their water content. The hygroscopicity depends on the chemical species that make up the particle. Here, we investigate the growth in particle size and composition that occurs with increasing RH for particles containing a series of amine compounds and sulfuric acid, typical atmospheric components, providing a comprehensive and accurate data set. HULIS are demonstrated to be important low-volatility, or even extremely low volatility, compounds in the organic aerosol phase. This sheds new light on the connection between atmospheric HULIS and ELVOCs. The interaction between HULIS and ammonium sulfate was found to decrease the volatility of the HULIS part in HULIS-AS mixed samples, indicating multiphase processes have the potential to lower the volatility of organic compounds in the aerosol phase. Recently, the winter haze pollution over the north central North China Plain has become severe. By treating the year-to-year increment as the predictand, two new statistical schemes were established using the multiple linear regression and the generalized additive model approaches. After cross validation, both of these models could capture the interannual and interdecadal trends and the extremums successfully. Independent tests for 2014 and 2015 also confirmed the good predictive skill. Discontinuities in apparent hygroscopicity below and above water saturation have been observed for organic and mixed organic-inorganic aerosol particles in both laboratory studies and in the ambient atmosphere. This work explores the extent to which such discontinuities are influenced by organic component molecular mass and viscosity, non-ideal thermodynamic interactions between aerosol components, and the combination of these factors. We investigated NOx impacts on the formation of secondary organic aerosol (SOA) mass from b-pinene and we could reveal two different mechanisms of impacts. One of them was the impact of NOx on OH that could explain increasing SOA yield with increasing NOx at low NOx conditions. The other was the suppression of new particle formation limiting the condensational sink for the SOA precursors. This effect could explain a substantial fraction of the decrease of SOA yield observed at high NOx. We investigated dust samples from dust source regions all over the globe with respect to their ice nucleation activity and their mineralogical composition. Stones of reference minerals were milled and investigated the same way as the natural dust samples. We found that the mineralogical composition is a major determinant of ice nucleation ability. Natural samples consist of mixtures of minerals with remarkably similar ice nucleation ability. Mineral dust particles are known to act as effective ice nucleating particles in the atmosphere and to play a role in the glaciation of mixed phase clouds. We have measured the ice nucleation activity of 15 different feldspar samples using a droplet freezing experiment and shown that alkali feldspars nucleate ice much more efficiently than plagioclase feldspars. We have also shown that certain "hyper-active" alkali feldspars nucleate ice very efficiently compared to typical alkali feldspars. Ahrens, L., Harner, T., and Shoeib, M.: Temporal variations of cyclic and linear volatile methylsiloxanes in the atmosphere using passive samplers and high-volume air samplers, Environ. Sci. Technol., 48, 9374–9381, https://doi.org/10.1021/es502081j, 2014. Atkinson, R.: Kinetics of the Gas-Phase Reactions of a Series of Organosilicon Compounds with OH and NO3 Radicals and O3 at 297+/-2 K, Environ. Sci. Technol., 25, 863–866, https://doi.org/10.1021/es00017a005, 1991. Brooke, D., Crookes, M., Gray, D., and Robertson, S.: Environmental Risk Assessment Report: Decamethylcyclopentasiloxane, Environment Agency of England and Wales, Bristol, UK, ISBN 978-1-84911-029-7, 223 pp., 2009a. Brooke, D., Crookes, M., Gray, D., and Robertson, S.: Environmental Risk Assessment Report: Dodecamethylcyclohexasiloxane, Environment Agency of England and Wales, Bristol, UK, ISBN 978-1-84911-030-3, 108 pp. 2009b. Brooke, D., Crookes, M., Gray, D., and Robertson, S.: Environmental Risk Assessment Report: Octamethylcyclotetrasiloxane, Environment Agency of England and Wales, Bristol, UK, ISBN 978-1-84911-031-0, 201 pp., 2009c. 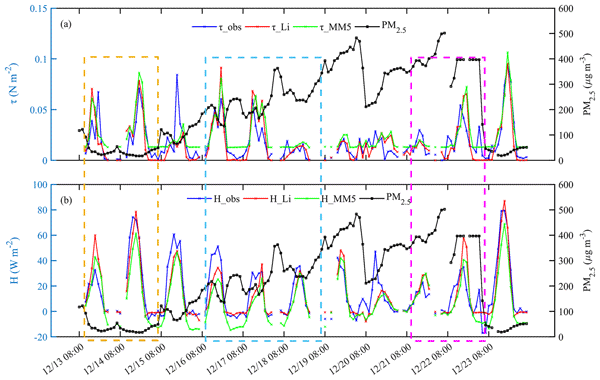 Buser, A. M., Kierkegaard, A., Bogdal, C., MacLeod, M., Scheringer, M., and Hungerbuhler, K.: Concentrations in Ambient Air and Emissions of Cyclic Volatile Methylsiloxanes in Zurich, Switzerland, Environ. Sci. Technol., 47, 7045–7051, https://doi.org/10.1021/es3046586, 2013. Bzdek, B. R., Horan, A. J., Pennington, M. R., Janechek, N. J., Baek, J., Stanier, C. O., and Johnston, M. V.: Silicon is a Frequent Component of Atmospheric Nanoparticles, Environ. Sci. Technol., 48, 11137–11145, https://doi.org/10.1021/es5026933, 2014. Capela, D., Alves, A., Homem, V., and Santos, L.: From the shop to the drain – Volatile methylsiloxanes in cosmetics and personal care products, Environ. Int., 92–93, 50–62, https://doi.org/10.1016/j.envint.2016.03.016, 2016. Cerully, K. M., Hite, J. R., McLaughlin, M., and Nenes, A.: Toward the Determination of Joint Volatility-Hygroscopicity Distributions: Development and Response Characterization for Single-Component Aerosol, Aerosol Sci. Technol., 48, 296–312, https://doi.org/10.1080/02786826.2013.870326, 2014. Chandramouli, B. and Kamens, R. M.: The photochemical formation and gas-particle partitioning of oxidation products of decamethyl cyclopentasiloxane and decamethyl tetrasiloxane in the atmosphere, Atmos. Environ., 35, 87–95, https://doi.org/10.1016/s1352-2310(00)00289-2, 2001. Chhabra, P. S., Lambe, A. T., Canagaratna, M. R., Stark, H., Jayne, J. T., Onasch, T. B., Davidovits, P., Kimmel, J. R., and Worsnop, D. R.: Application of high-resolution time-of-flight chemical ionization mass spectrometry measurements to estimate volatility distributions of α-pinene and naphthalene oxidation products, Atmos. Meas. Tech., 8, 1–18, https://doi.org/10.5194/amt-8-1-2015, 2015. Clarson, S. J. and Semlyen, J. A.: Studies of cyclic and linear poly(dimethyl-siloxanes): 21. High temperature thermal behaviour, Polymer, 27, 91–95, https://doi.org/10.1016/0032-3861(86)90360-5, 1986. Coggon, M. M., McDonald, B. C., Vlasenko, A., Veres, P. R., Bernard, F., Koss, A. R., Yuan, B., Gilman, J. B., Peischl, J., Aikin, K. C., DuRant, J., Warneke, C., Li, S.-M., and de Gouw, J. A.: Diurnal Variability and Emission Pattern of Decamethylcyclopentasiloxane (D5) from the Application of Personal Care Products in Two North American Cities, Environ. Sci. Technol., 52, 5610–5618, https://doi.org/10.1021/acs.est.8b00506, 2018. Companioni-Damas, E. Y., Santos, F. J., and Galceran, M. T.: Linear and cyclic methylsiloxanes in air by concurrent solvent recondensation-large volume injection-gas chromatography-mass spectrometry, Talanta, 118, 245–252, https://doi.org/10.1016/j.talanta.2013.10.020, 2014. Davis, D. D., Ravishankara, A. R., and Fischer, S.: SO2 oxidation via the hydroxyl radical: Atmospheric fate of HSOx radicals, Geophys. Res. Lett., 6, 113–116, https://doi.org/10.1029/GL006i002p00113, 1979. Dudzina, T., von Goetz, N., Bogdal, C., Biesterbos, J. W. H., and Hungerbuhler, K.: Concentrations of cyclic volatile methylsiloxanes in European cosmetics and personal care products: Prerequisite for human and environmental exposure assessment, Environ. Int., 62, 86–94, https://doi.org/10.1016/j.envint.2013.10.002, 2014. ECHA: Annex XV Restriction Report Proposal for a Restriction (D4 and D5), Health & Safety Executive, Bootle, UK, 94 pp., 2015. ECHA: 10 new substances added to the Candidate List: https://echa.europa.eu/-/ten-new-substances-added-to-the-candidate-list, last access: June 2018. Environment Canada and Health Canada: Screening Assessment for the Challenge Dodecamethylcyclohexasiloxane (D6), 83 pp., 2008a. Environment Canada and Health Canada: Screening Assessment for the Challenge Decamethylcyclopentasiloxane (D5), 97 pp., 2008b. Environment Canada and Health Canada: Screening Assessment for the Challenge Octamethylcyclotetrasiloxane (D4), 90 pp., 2008c. 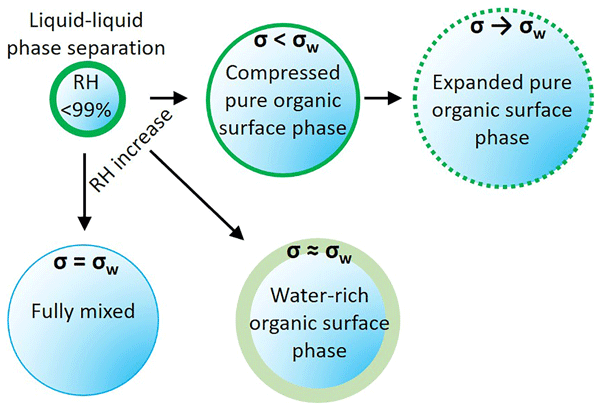 Erhart, T. G., Golz, J., Eicker, U., and van den Broek, M.: Working Fluid Stability in Large-Scale Organic Rankine Cycle-Units Using Siloxanes-Long-Term Experiences and Fluid Recycling, Energies, 9, 1–16, https://doi.org/10.3390/en9060422, 2016. Genualdi, S., Harner, T., Cheng, Y., MacLeod, M., Hansen, K. M., van Egmond, R., Shoeib, M., and Lee, S. C.: Global Distribution of Linear and Cyclic Volatile Methyl Siloxanes in Air, Environ. Sci. Technol., 45, 3349–3354, https://doi.org/10.1021/es200301j, 2011. Gouin, T., van Egmond, R., Sparham, C., Hastie, C., and Chowdhury, N.: Simulated use and wash-off release of decamethylcyclopentasiloxane used in anti-perspirants, Chemosphere, 93, 726–734, https://doi.org/10.1016/j.chemosphere.2012.10.042, 2013. Hall, A. D. and Patel, M.: Thermal stability of foamed polysiloxane rubbers: Headspace analysis using solid phase microextraction and analysis of solvent extractable material using conventional GC–MS, Polym. Degrad. Stab., 91, 2532–2539, https://doi.org/10.1016/j.polymdegradstab.2005.12.017, 2006. Horii, Y. and Kannan, K.: Survey of organosilicone compounds, including cyclic and linear siloxanes, in personal-care and household products, Arch. Environ. Con. Tox., 55, 701–710, https://doi.org/10.1007/s00244-008-9172-z, 2008. Janechek, N. J., Hansen, K. M., and Stanier, C. O.: Comprehensive atmospheric modeling of reactive cyclic siloxanes and their oxidation products, Atmos. Chem. Phys., 17, 8357–8370, https://doi.org/10.5194/acp-17-8357-2017, 2017. 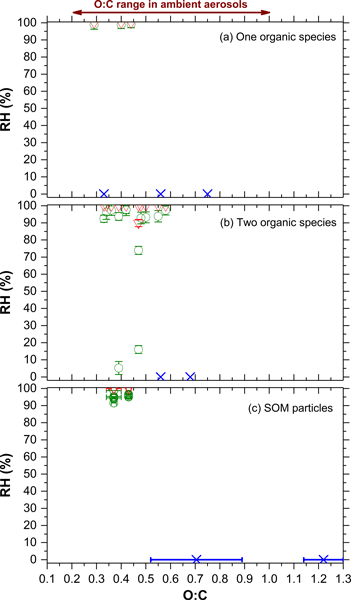 Kang, E., Toohey, D. W., and Brune, W. H.: Dependence of SOA oxidation on organic aerosol mass concentration and OH exposure: experimental PAM chamber studies, Atmos. Chem. Phys., 11, 1837–1852, https://doi.org/10.5194/acp-11-1837-2011, 2011. Karl, T., Striednig, M., Graus, M., Hammerle, A., and Wohlfahrt, G.: Urban flux measurements reveal a large pool of oxygenated volatile organic compound emissions, P. Natl. Acad. Sci. USA, 115, 1186–1191, https://doi.org/10.1073/pnas.1714715115, 2018. Kierkegaard, A. and McLachlan, M. S.: Determination of decamethylcyclopentasiloxane in air using commercial solid phase extraction cartridges, J. Chromatogr. A, 1217, 3557–3560, https://doi.org/10.1016/j.chroma.2010.03.045, 2010. 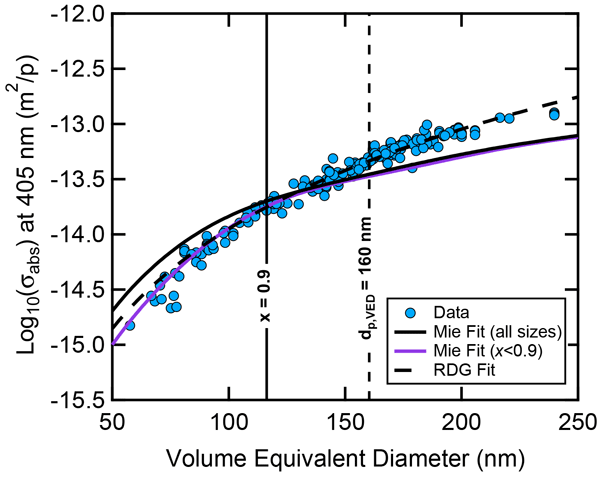 Krechmer, J. E., Pagonis, D., Ziemann, P. J., and Jimenez, J. L.: Quantification of Gas-Wall Partitioning in Teflon Environmental Chambers Using Rapid Bursts of Low-Volatility Oxidized Species Generated in Situ, Environ. Sci. Technol., 50, 5757–5765, https://doi.org/10.1021/acs.est.6b00606, 2016. Kroll, J. H., Smith, J. D., Che, D. L., Kessler, S. H., Worsnop, D. R., and Wilson, K. R.: Measurement of fragmentation and functionalization pathways in the heterogeneous oxidation of oxidized organic aerosol, Phys. Chem. Chem. Phys., 11, 8005–8014, https://doi.org/10.1039/B905289E, 2009. Lambe, A. and Jimenez, J. L.: PAM Wiki: Estimation Equations, availabe at: https://sites.google.com/site/pamwiki/hardware/estimation-equations (last access: February 2018), 2018. Latimer, H. K., Kamens, R. M., and Chandra, G.: The Atmospheric Partitioning of Decamethylcylcopentasiloxane (D5) and 1-Hydroxynonomethylcyclopentasiloxane (D4TOH) on Different Types of Atmospheric Particles, Chemosphere, 36, 2401–2414, https://doi.org/10.1016/S0045-6535(97)10209-0, 1998. Lei, Y. D., Wania, F., and Mathers, D.: Temperature-Dependent Vapor Pressure of Selected Cyclic and Linear Polydimethylsiloxane Oligomers, J. Chem. Eng. Data, 55, 5868–5873, https://doi.org/10.1021/je100835n, 2010. Leith, D., Miller-Lionberg, D., Casuccio, G., Lersch, T., Lentz, H., Marchese, A., and Volckens, J.: Development of a Transfer Function for a Personal, Thermophoretic Nanoparticle Sampler, Aerosol Sci. Technol., 48, 81–89, https://doi.org/10.1080/02786826.2013.861593, 2014. Lu, Y., Yuan, T., Wang, W., and Kannan, K.: Concentrations and assessment of exposure to siloxanes and synthetic musks in personal care products from China, Environ. Pollut., 159, 3522–3528, https://doi.org/10.1016/j.envpol.2011.08.015, 2011. Mackay, D., Cowan-Ellsberry, C. E., Powell, D. E., Woodburn, K. B., Xu, S., Kozerski, G. E., and Kim, J.: Decamethylcyclopentasiloxane (D5) environmental sources, fate, transport, and routes of exposure, Environ. Toxicol. Chem., 34, 2689–2702, https://doi.org/10.1002/etc.2941, 2015. MacLeod, M., von Waldow, H., Tay, P., Armitage, J. M., Wohrnschimmel, H., Riley, W. J., McKone, T. E., and Hungerbuhler, K.: BETR global – A geographically-explicit global-scale multimedia contaminant fate model, Environ. Pollut., 159, 1442–1445, https://doi.org/10.1016/j.envpol.2011.01.038, 2011. McDonald, B. C., de Gouw, J. A., Gilman, J. B., Jathar, S. H., Akherati, A., Cappa, C. D., Jimenez, J. L., Lee-Taylor, J., Hayes, P. L., McKeen, S. A., Cui, Y. Y., Kim, S.-W., Gentner, D. R., Isaacman-VanWertz, G., Goldstein, A. H., Harley, R. A., Frost, G. J., Roberts, J. M., Ryerson, T. B., and Trainer, M.: Volatile chemical products emerging as largest petrochemical source of urban organic emissions, Science, 359, 760–764, https://doi.org/10.1126/science.aaq0524, 2018. McLachlan, M. S., Kierkegaard, A., Hansen, K. M., van Egmond, R., Christensen, J. H., and Skjoth, C. A.: Concentrations and Fate of Decamethylcyclopentasiloxane (D-5) in the Atmosphere, Environ. Sci. Technol., 44, 5365–5370, https://doi.org/10.1021/es100411w, 2010. Montemayor, B. P., Price, B. B., and van Egmond, R. A.: Accounting for intended use application in characterizing the contributions of cyclopentasiloxane (D5) to aquatic loadings following personal care product use: antiperspirants, skin care products and hair care products, Chemosphere, 93, 735–740, https://doi.org/10.1016/j.chemosphere.2012.10.043, 2013. OECD Environment Directorate: The 2004 OECD List of High Production Volume Chemicals, OECD Environment Directorate Environment, Health and Safety Division, Paris, FR, 143 pp., 2004. Peng, Z., Day, D. A., Ortega, A. M., Palm, B. 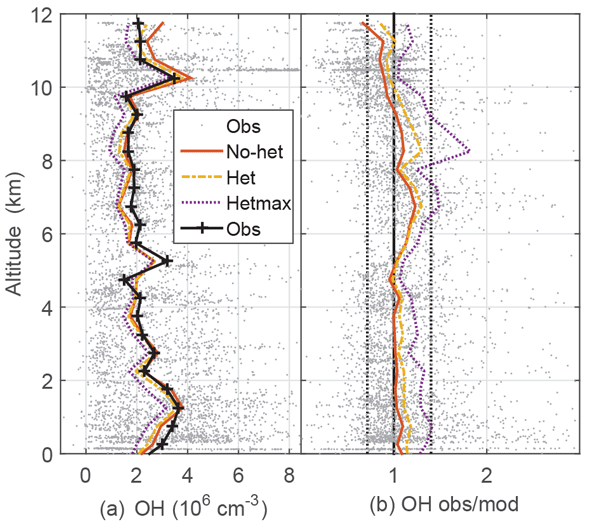 B., Hu, W., Stark, H., Li, R., Tsigaridis, K., Brune, W. H., and Jimenez, J. L.: Non-OH chemistry in oxidation flow reactors for the study of atmospheric chemistry systematically examined by modeling, Atmos. Chem. Phys., 16, 4283–4305, https://doi.org/10.5194/acp-16-4283-2016, 2016. Roberts, G. C. and Nenes, A.: A continuous-flow streamwise thermal-gradient CCN chamber for atmospheric measurements, Aerosol Sci. Technol., 39, 206–221, https://doi.org/10.1080/027868290913988, 2005. Rose, D., Gunthe, S. S., Mikhailov, E., Frank, G. P., Dusek, U., Andreae, M. O., and Pöschl, U.: Calibration and measurement uncertainties of a continuous-flow cloud condensation nuclei counter (DMT-CCNC): CCN activation of ammonium sulfate and sodium chloride aerosol particles in theory and experiment, Atmos. Chem. Phys., 8, 1153–1179, https://doi.org/10.5194/acp-8-1153-2008, 2008. Singh, A.: Measurement of the physical properties of ultrafine particles in the rural continental U.S., The University of Iowa, Ph.D. dissertation, 2015. Sommerlade, R., Parlar, H., Wrobel, D., and Kochs, P.: Product Analysis and Kinetics of the Gas-Phase Reactions of Selected Organosilicon Compounds with OH Radicals Using a Smog Chamber – Mass Spectrometer System, Environ. Sci. Technol., 27, 2435–2440, https://doi.org/10.1021/es00048a019, 1993. Tang, X., Misztal, P. K., Nazaroff, W. W., and Goldstein, A. H.: Siloxanes Are the Most Abundant Volatile Organic Compound Emitted from Engineering Students in a Classroom, Environ. Sci. Tech. Lett., 2, 303–307, https://doi.org/10.1021/acs.estlett.5b00256, 2015. Varaprath, S., Frye, C. L., and Hamelink, J.: Aqueous solubility of permethylsiloxanes (silicones), Environ. Toxicol. Chem., 15, 1263–1265, https://doi.org/10.1002/etc.5620150803, 1996. Wang, R., Moody, R. P., Koniecki, D., and Zhu, J.: Low molecular weight cyclic volatile methylsiloxanes in cosmetic products sold in Canada: implication for dermal exposure, Environ. Int., 35, 900–904, https://doi.org/10.1016/j.envint.2009.03.009, 2009. Willeke, K. and Baron, P. A.: Aerosol Measurement Principles, Techniques, and Applications, Van Nostrand Reinhold, New York, 876 pp., 1993. Winkler, P. M., Ortega, J., Karl, T., Cappellin, L., Friedli, H. R., Barsanti, K., McMurry, P. H., and Smith, J. N.: Identification of the biogenic compounds responsible for size-dependent nanoparticle growth, Geophys. Res. Lett., 39, L20815, https://doi.org/10.1029/2012GL053253, 2012. Wu, Y. and Johnston, M. V.: Molecular Characterization of Secondary Aerosol from Oxidation of Cyclic Methylsiloxanes, J. Am. Soc. Mass. Spectr., 27, 402–409, https://doi.org/10.1007/s13361-015-1300-1, 2016. Wu, Y. and Johnston, M. V.: Aerosol Formation from OH Oxidation of the Volatile Cyclic Methyl Siloxane (cVMS) Decamethylcyclopentasiloxane, Environ. Sci. Technol., 51, 4445–4451, https://doi.org/10.1021/acs.est.7b00655, 2017. Xu, S. and Wania, F.: Chemical fate, latitudinal distribution and long-range transport of cyclic volatile methylsiloxanes in the global environment: a modeling assessment, Chemosphere, 93, 835–843, https://doi.org/10.1016/j.chemosphere.2012.10.056, 2013. Yucuis, R. A., Stanier, C. O., and Hornbuckle, K. C.: Cyclic siloxanes in air, including identification of high levels in Chicago and distinct diurnal variation, Chemosphere, 92, 905–910, https://doi.org/10.1016/j.chemosphere.2013.02.051, 2013. Zhao, D. F., Buchholz, A., Kortner, B., Schlag, P., Rubach, F., Kiendler-Scharr, A., Tillmann, R., Wahner, A., Flores, J. M., Rudich, Y., Watne, Å. K., Hallquist, M., Wildt, J., and Mentel, T. F.: Size-dependent hygroscopicity parameter (κ) and chemical composition of secondary organic cloud condensation nuclei, Geophys. Res. Lett., 42, 10920–10928, https://doi.org/10.1002/2015GL066497, 2015.